So a new update appeared for ISE, and I installed it, took about two hours… Worked for about five minutes then failed with the usual Xilinx cryptic message system this one being, ‘ error message, when i tried to edit the .v I’d just created and compiled earlier, refusing to edit the file. So i reverted the changes, another hour+ gone, just basically moving/deleting files!, quad core 3 GHz with a 10,000 RPM WD drive under XP. It uses lots and lots of little files, so disable any antivirus you have since it’ll kill the already terrible speed as well as ruin your disk space. Suggest Xilinx look into using a different system, single packed files perhaps ?., works for practically all the video games out there, WAD files etc.. 1000’s of small files is just bad, it always kills performance. This is the uninstaller, fills you with hope doesn’t it! Started off ok, then after about 40% did this. My guess is memory corruption. I wonder if they have they seen this XKCD comic ? Still at least I’ve got some episodes of Top Gear and Doctor Who to watch on TiVo. It is December 25th, I just can’t imagine there are many people downloading from xilinx.com and i did a few tests at speedtest.net etc, I’m getting plenty of bandwidth. Ok finally moved off 40% and now its in the make 100’s of backup folders to copy the existing files into for the rollback. Since the patch is so large it seems to replace just about everything. I’m wondering how long this would take instead ? 1. recursive zip on all folders in ISE. 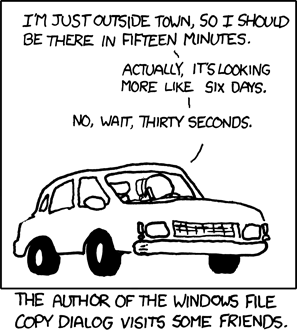 Or just rename the existing folder to backup_xxx and then install a fresh copy. Even a differential archive shouldn’t take this long. I’m watching it with Filemon from time to time, recursively generating deep directories and copying. We keep our software updates in a content management system like subversion, so you just update to the latest, and you can go back to older versions easily, releases are tagged. It’s fairly hammering along now thanks to the 10,000 RPM drive. 70% at 6:58PM, but I watched Jeremy Clarkson drive to the North Pole since this started. 79% and its stalled again , since its downloading more data. 83% 7:17 PM, 84% 7:33PM, and this is the second time today I’ve installed it, around 5 hours to install/rollback/reinstall and i don’t know if it’ll work. Woo Hoo 100% at 7:56PM , but whats this ? I’m curious to know how much of the data being downloaded is actually different. ISE is just an awful tool. We’re spoiled rotten with C/C++ tools like Developer Studio. FPGA’s are often used because they are fast, the coincidence isn’t lost on me. Best I can think of is, don’t use the updater, delete and redownload it in whole, or just leave it overnight. Seems to be ok now, I don’t know if I’ll get the original error or not. ISE crashes very consistently after editing the timing constraints file.